Tradition suggests that when St Ignatius was a little boy, the Savior hugged him and said: "Unless you turn and become as little children, you shall not enter into the Kingdom of Heaven" (Mt. 18:3). The saint was called "God-Bearer" (Theophoros), because he bore God in his heart and prayed unceasingly to Him. He also had this name because he was held in the arms of Christ, the incarnate Son of God. On the way to Rome, the ship sailed from Seleucia stopped at Smyrna, where St Ignatius met with his friend Bishop Polycarp. Clergy and believers from other cities and towns thronged to see St Ignatius. He exhorted everyone not to fear death and not to grieve for him. In his Epistle to the Roman Christians, he asked them to assist him with their prayers, and to pray that God would strengthen him in his impending martyrdom for Christ: "I seek Him Who died for us; I desire Him Who rose for our salvation... In me, desire has been nailed to the cross, and no flame of material longing is left. Only the living water speaks within me, saying, 'Hasten to the Father.'" On the way to Rome St Ignatius visited several churches, teaching and guiding the Christians there. He also wrote seven epistles: to the churches of Ephesus, Magnesia, Tralles, Rome, Philadelphia, and Smyrna. He also addressed a letter to St Polycarp, who mentions a collection of the letters of St Ignatius in his letter to the Philippians (Ch. 13). St Irenaeus of Lyons quotes from St Ignatius's letter to the Romans (AGAINST HERESIES 5:28:4). All these letters have survived to the present day. On December 20, the day of a pagan festival, they led St Ignatius into the arena, and he turned to the people: "Men of Rome, you know that I am sentenced to death, not because of any crime, but because of my love for God, by Whose love I am embraced. I long to be with Him, and offer myself to him as a pure loaf, made of fine wheat ground fine by the teeth of wild beasts." After this the lions were released and tore him to pieces, leaving only his heart and a few bones. Tradition says that on his way to execution, St Ignatius unceasingly repeated the name of Jesus Christ. When they asked him why he was doing this, St Ignatius answered that this Name was written in his heart, and that he confessed with his lips Him Whom he always carried within. When the saint was devoured by the lions, his heart was not touched. When they cut open the heart, the pagans saw an inscription in gold letters: "Jesus Christ." After his execution St Ignatius appeared to many of the faithful in their sleep to comfort them, and some saw him at prayer for the city of Rome. Hearing of the saint's great courage, Trajan thought well of him and stopped the persecution against the Christians. 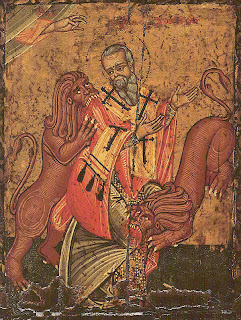 The relics of St Ignatius were transferred to Antioch (January 29), and on February 1, 637 were returned to Rome and placed in the church of San Clemente.